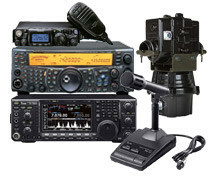 For over 20 years, Hamshop has been dealing in used radio transmitting equipment. We exchange or purchase equipment only if we are 100% sure that we’re dealing with nearly-new, trustworthy equipment that is in perfect condition. You won’t find any old, untraceable or damaged equipment for sale on our site. Many customers know where to find us and email us their wishes, meaning some used equipment doesn’t even make it into our webshop. The warranty terms accompany the item.